It’s been 11 years since legendary restaurateur Bob Sikora opened his first Bobby Q restaurant and now Bobby Q”s has come to Mesa! 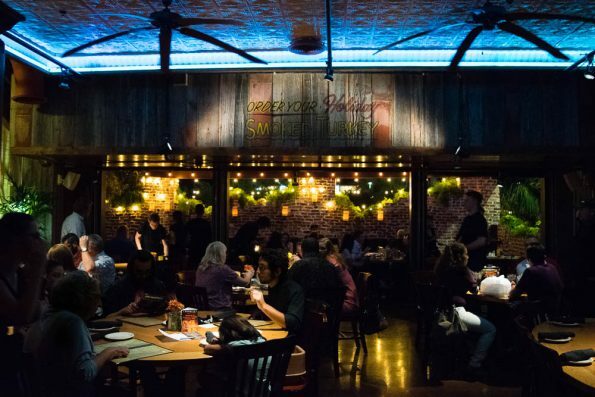 Highly ranked with Open Table and Yelp, Bobby Q’s makes good on it’s promise to deliver tasty bbq. In addition to his extensive barbecue research mixed with his culinary expertise, the secret behind Bobby Q’s barbeque lies within the slow cooking process over Tennessee hickory wood paired with the perfect blend of spices found in the special dry rub for the meat, as executed by barbeque master, Executive Chef Mark Hittle. This results in succulent hand-pulled pork, smoky sausage links, fork-tender brisket, and ribs that fall right off the bone. We recently were invited to preview the new Bobby Q location in Mesa. 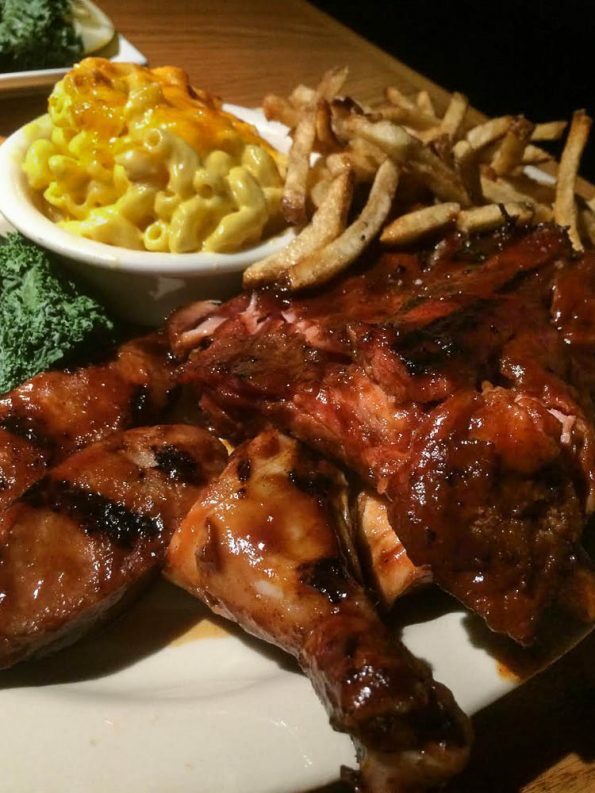 We understand that it is tough to hear about another good bbq joint but we would never lead you astray, this bbq is hands down delicious! The attention to detail and quality is apparent from the moment you walk in the door. From the craft cocktails (the bar is helmed by Chris Ortega, who is one of the most knowledgeable and interesting bartenders in the valley) to the first bite of food, and even when you are handed delicious beignet style doughnuts before you leave, it is obvious that there is a lot of love put into Bobby Q’s. Surprised to see an actual craft cocktail menu (Plantation Pineapple Rum people!) at a bbq restaurant, we ordered cocktails first. We started with a Sinatra Smash and a Pineapple Passion. The Sinatra Smash (Gentleman Jack Bourbon, Creme de Cassis, Vanilla Syrup, House Made Sweet and Sour, and Fresh Blackberries) is a well balanced sweet and sour cocktail. When talking to Chris about his cocktails he said that balance is everything. You don’t always have to play by the rule but you need to understand them. 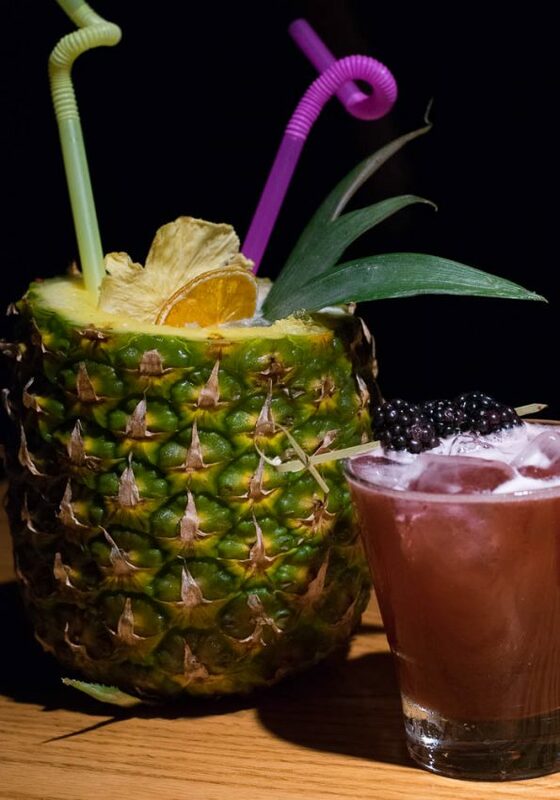 We also ordered the Pineapple Passion (Plantation Pineapple Rum, Clement Marina Coconut, Coconut Syrup, fresh Pineapple Juice and fresh Lime Juice). What drew us to this cocktail was the use of Plantation Pineapple Rum. As we mentioned earlier, it was quite a surprise to see craft ingredients at a bbq restaurant. By the way, it was amazing AND served in a pineapple! Lets get to what you really came here for, the food! We started our meal with the Crispy Sweet Onion Block which not only looks impressive but taste great! Be warned, this thing is large and in charge. The two of us hardly made a dent in our order despite our best efforts. While you might feel that you should eat them with ranch, give the bbq ketchup a shot. You won’t be disappointed! For our first entree we went with a Three Meat Combo (we selected Baby Back Ribs, BBQ Chicken, and Hot Links) with a side of mac and cheese and french fries. The ribs were fall off the bone tender. Sauced with just enough sauce (enough to get a little messy but not so much that you feel like sticky mess after), the smokiness and sauce made them a true delight. The chicken was juicy and tender with the same delicious smokiness. The real star of the plate however was the Hot Links. How can Hot Links possibly steal the show from ribs so tender the meat falls off the bones? Well, here is the thing, they aren’t super spicy but they are packed full of flavor. The charred flavor permeates through out the piece of meat! That being said, the entire entree was heavenly, the mac and cheese and fries were killer as well! We also ordered the Catfish Po’boy with the pecan cole slaw. This sandwich was a pleasant surprise. The catfish came out crispy despite having sauce and pickles. The breading itself was seasoned well and tasty. Typically we don’t care for pickles on hot sandwiches, especially breaded ones, but these really worked. The combo of the red sauce, tarter sauce, and pickles created a melding of flavors you’d never expect to work on catfish but it really did! We really enjoyed Bobby Q’s. Not only is the food fantastic, but the whole vibe of the restaurant is fun. We can’t wait to go back! Those Hot Links are calling our name! Have you been to Bobby Q’s? What was your favorite thing to eat? Better yet, how do you like your bbq? Inquiring minds want to know! Leave a comment below or use the hash tag #GeekEats!